About a dozen freshman Republicans in the Texas House have filed dozens of amendments to the state budget with the same goal: defunding various programs and agencies and putting that money toward retired teachers. The group of approximately 11 members has filed more than three dozens amendments to Senate Bill 1, each of which proposes taking money away from a state program or agency and allocating it toward the Teacher Retirement System’s retiree group health insurance plan, also known as TRS-Care. 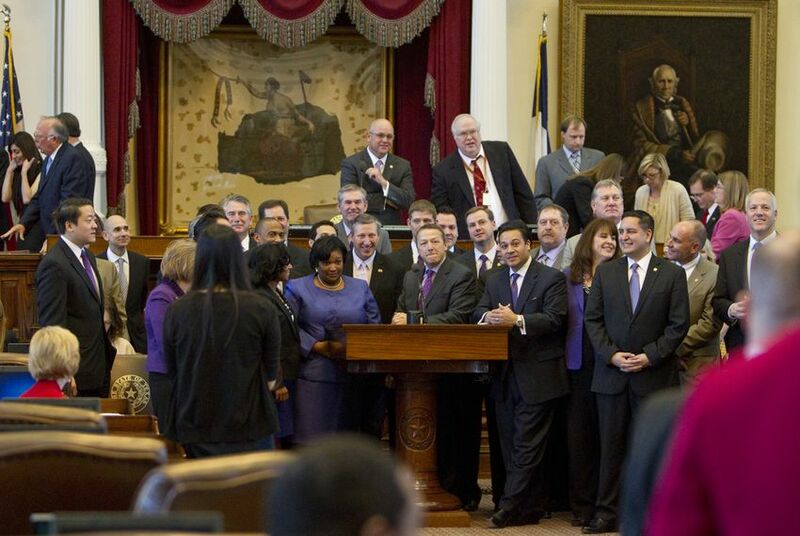 The amendments could force House members to vote on whether to keep funding programs as varied as the Commission on the Arts and the Texas Commission on Environmental Quality’s Clean School Bus program or put that amount toward the state’s retired teachers. “I don’t know how you justify clean school bus programs and you allow TRS-Care to go broke,” said state Rep. Steve Toth, R-The Woodlands, who filed four such amendments. Other Republican House members participating in the effort include state Reps. Craig Goldman of Fort Worth, Stephanie Klick of Fort Worth, Matt Krause of Fort Worth, Jeff Leach of Plano, Rick Miller of Sugar Land, Jonathan Stickland of Bedford, Scott Sanford of McKinney, Matt Schaefer of Tyler, Drew Springer of Muenster and Scott Turner of Richardson. As part of the coordinated campaign, the 11 members filed approximately 37 budgets amendments out of 267 that were filed by all House members ahead of last week's filing deadline. The amendments attempt to defund agencies including the Board of Professional Geoscientists and the Board of Professional Land Surveying, as well as programs such as the Texas Workforce Commission’s Skills Development Fund. The TCEQ, the Department of Agriculture and the Texas Education Association are each targeted in several amendments. So is money that goes to the Texas Railroad Commission, the state's oil and gas regulator, to promote alternative energy resources. Toth said the ultimate goal of the amendments is two-fold: make a stand for smaller government and draw more attention to the state’s pension liabilities. The proposed House budget allocates $495 million toward the Teacher Retirement System’s retiree health costs, a 33 percent increase from the current budget. A September report by the Teachers Retirement System on TRS-Care found that the system is projected to have a $1.2 billion shortfall in the 2016-17 biennium. The group of Republican freshman had been searching for a place in the state budget that they believed needed more funding when TRS came up in discussion, Krause said. He described the amendments as targeting programs that the members believe are not "essential" government services. “It’s being fiscally responsible and sending a message to our teachers that we’re planning to take care of them,” Krause said. State Rep. Charles Perry, a Lubbock Republican who sits on the House Appropriations Committee, which writes the budget, said he spoke to some of the freshmen members who were searching for a way to have more of a say in the budget process. He said he suggested they look at the unfunded liabilities in programs such as TRS-Care and consider making use of the amendment process on the budget. “It’s how, if you’re not on the appropriations committee, you can have your voice heard,” Perry said. Perry said he supports the freshmen’s efforts to draw attention to the state’s pension plans. “We have to begin this process of how we’re going to address this unfunded liabilities,” Perry said.